A man goes to his doctor and is dismayed to learn he has a bad case of Bert and Ernie. The exchange continues and makes about as much sense as an earlier one, in which Britney Spears, a janitor and a bottle of Pepto-Bismol vie for a date with a contestant who is behind a screen and cannot see them. “Where will you take me on our first date?” the contestant asks. “CVS or Rite-Aid,” the person playing the pink bottle answers sweetly. 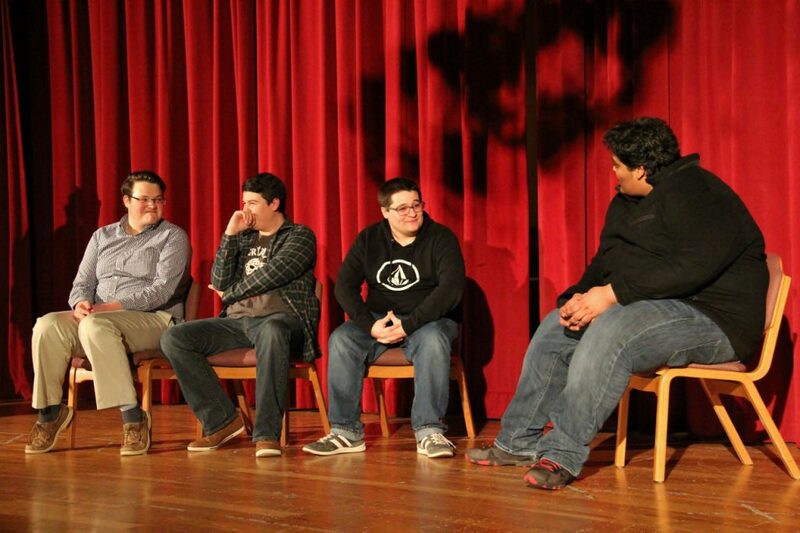 The random characters, scenarios and bits of dialogue were shouted out by fellow Saint Rose students in a good-natured effort to trip up the troupe known as Crate of Apes. 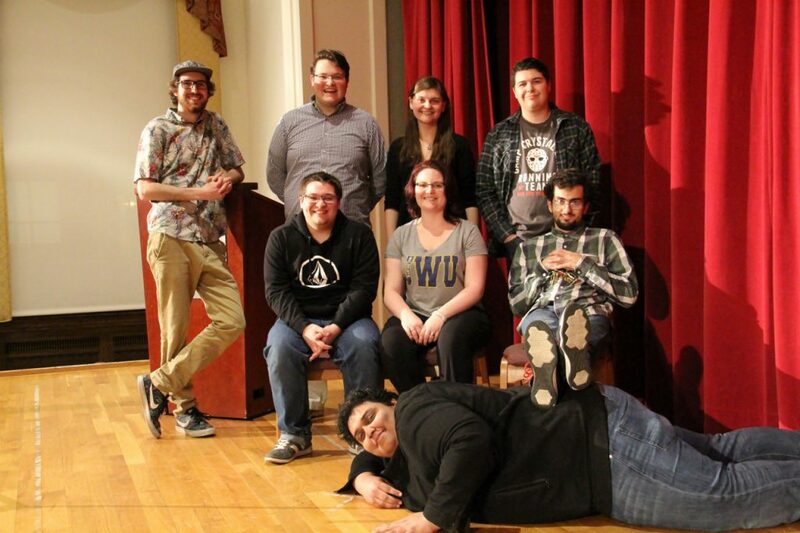 Equal parts Three Strooges, Jimmy Fallon and “Whose Line is this Anyway?” the student improv group works hard to put facts and circumstances together convincingly without the benefit of their making sense – or any time to prepare. 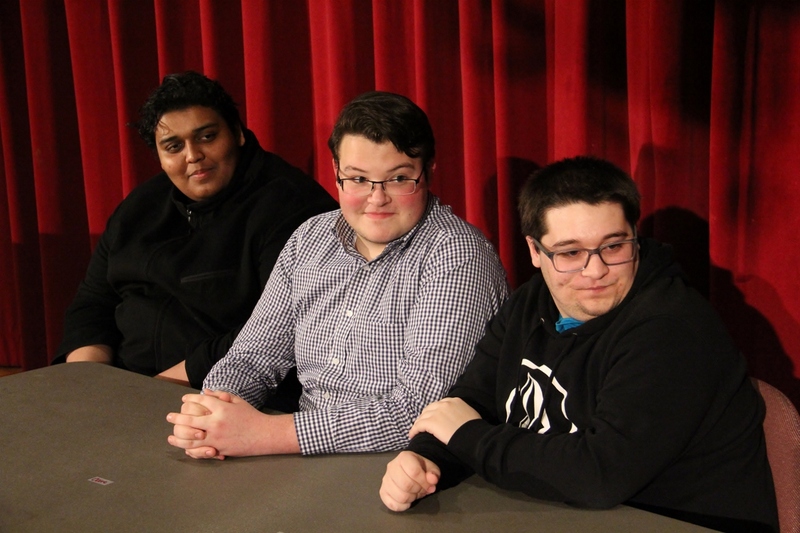 Rehearsing for the Dating Game-meets-Crate of Apes are juniors Kyle Pratt and Zach Tallarino, freshman Brandon Mason and sophomore Marc Tabales. During a recent evening performance at St. Joe’s, “Crate” did an impressive job on this front, creating sketches out of whatever was thrown at them from scraps of paper or suggestions called out from the audience. There was the Dating Game, in which the person assigned to play a janitor said “You look like a guy who needs a nice mop and bucket” to the perplexed contestant. In another game they were assigned “cow,” and several other words they needed to make into a sketch lasting 60 seconds, then perform the same in 30 seconds and eventually one second. Somehow, it worked; they sped through the scene in the blink of an eye. The joke was on the performers, who had to exhibit both mental and physical dexterity. And it seemed that the harder they worked, the louder the laughs from the audience of 40 or so students. Far from scaring him, one “Crates” performer said he welcomes the barrage of ridiculous assignments. Mirroring the rise in sketch comedy across the country, Crate of Apes was started in 2014. And while the troupe revels in spontaneity, the members rehearse weekly and club president Kyle Pratt takes workshops to learn improv techniques For the second year in a row Crate of Apes will take part in the Albany Improv Festival April 22 and 23 in the Upper Room at 59 North Pearl Street in downtown Albany. Pratt noted that regardless of how absurd the situation, improv performers actually thrive on being serious. The whole Crate: Top row, left to right junior Greg Meyers, junior Kyle Pratt, senior Alexandra Dindy and senior Zach Tallarino. Center, from left, freshman Brandon Mason, senior Rosie Lenz and sophomore Theodore Stabile. Sophomore Marc Tabales, in front.